But I would continue the candle. Spirit may have wanted a personal concern of yours. That is my gut feeling. It’s been awhile since I’ve done candle work and I think I need to do some work for my love relationship. I was thinking of doing a run of 3 bride and groom candles but just need some direction on which color. We’ve been having a lot of disagreements and just not getting along great. A lot of the compassion and caring seems to be strained between us and we are struggling to get along. We want to stay together and work on things but it isn’t going so well. I thought some candles might help. But which bride and groom candle would be best. Blue or pink? We need to end the quarreling and restore the passion. Both seem to apply but I’m not sure if one color would be better than the other or if I should mix and match or do 3 of blue and 3 of pink. Any suggestions and guidance anyone could offer would be most helpful. Thanks! I'd start with blue candles to heal raw feelings and past hurts, then pink for love and care, then red for passion. Yes that does help thank you! How many should I do if each? I've been researching some things as far as sending someone away, but I saw something online that said I would need a black candle, but having a candle in the image of a man or woman would work better. Is that true and if so, where can I find such candle? Thank you so much RevJames! Hello. Brand new to posting. So it's a little confusing on how and where to post. I have a question and I'm sure it's on here somewhere but I can't find it- but I want to ask if it's okay to burn more than one spell/fixed candle at a time? I've read it's best to focus on 1 so the intention is strongest but what if I have 2 candles that are similar and feel like they could be burned the same time? Or is it best to just focus on 1? If you have two candles that you feel should be burned together, go for it. I think it just depends on your skill and focus level whether you burn candles at the same time. Some people need to do them one at a time so they can focus, others can burn more than one at a time. So just feel out what you can handle. This is a question regarding 3 candles I am buying from lucky mojo regarding my terrible neighbor. First I must give a bit of a backstory, I am a candle MAKER, and will make candles like this for others with help from elders..but FOR ME when it comes to these sorts of candles I buy them, especially since lucky mojo fixes them. She has cursed me through the walls (w loud voice so I could hear) with some sort of egg ritual very loudly around 2 most ago, then when her daughter arrived home later that day with groceries, I guess she purchased eggs, and the woman loudly said "we love eggs" numberous times. She has said nasty things about me in the hallway, one time about my candle scents I was purchasing on the phone. Another time outside because I said to myself, oh these candles are lovely. I heard a response "try ugly".. where she knew I could hear (I live in an apartment) and in general, I believe she is working against me, or at least sending out negativity towards me. I clean my doorknob with Florida water often. Funny thing is when she first moved in I offered her 2 normal candles I had made as a house warming gift. Very nicely designed, too.. with the smell of gardenia for one and patchouli for the other. I was trying to be nice. I heard through in another conversation VERY LOUD ..she threw them away immediately because she doesn't trust anyone who makes candles. That hurt because they took like an hour to make, and the drying process is over 24 hrs, and I believe this woman is horrible. She's an enemy. So fast forward and thanks for listening, I am purchasing 3 candles from lucky mojo, the confusion candle, the crossing candle, and the hot foot. My question is.. are these good choices? Should I burn them all at once? I have a main altar candle it's candle is a red one shaped as a Cross w keys since Jesus is who I pray to.. should I light that before lighting the candles then pray and light them..? Then, snuff out my cruciform candle? Or should I NOT light all three at once and pray each prayer with the altar candle lit, snuff out, then let that ONE CANDLE burn... Then go on to the next, ect. Is this just totally a bad idea? Please excuse my ignorance, I just began practicing in June. I'm here to learn my path. Need guidance and help. I have learned a lot here and Thanks in advance about the candle questions. I'm so sorry for anything I may have posted that I shouldn't have. When you light your altar candle is up to you, you could light it just when you light your other candles and then snuff it out, or light it and let it burn down. And you don't need to add anything else to the bath other than the hyssop. Take a cupful of the water to the crossroads when you are done. Since the altar candle was burned just a general spiritual candle, you can bury the wax from that candle in your front yard. It all depends on your needs, the goal of the spell, the way you want to work, and what materials you have on hand. If I wanted to get a job, a glass-encased vigil candle burned over seven days would give the spell a lot of oomph, but if I was in a pinch, a tea light would work too, but maybe wouldn't be as powerful. Make sense? So it depends on the situation. The more you read this forum and study, the more you'll understand. Hi sister Jean, thank you so much for your replies, I purchased EVERYTHING from lucky mojo this morning, all 3 candles, and a peaceful home candle to burn after all is done, the altar candle, including the hyssop. The problem is I don't have a don't have a front yard, I love in an apartment. We have cement! should I take that wax to the crossroads with me too and throw it over my shoulder with the bath water?? You could always bury the wax in a potted plant and put it by your front door. If that's not possible then crossroads deployment is fine. It's a more neutral place to deploy spell remnants. Sister Jean, you're the best for your time and replies..My front door is rows and blocks of carpeted apartment doors. I guess I'll take it with me with the hyssop bath water and leave it all there when I'm done. Ugh!! Right now that dreaded woman is blasting music so loud it's shaking the walls, when I came home nothing was on, mind you. I really hope my ritual works. Should I write a petition under the candles, her name and my desires for her for each of them or something? I never want to see her again or her annoying family again. She's been an enemy for some time. I know her boyfriend's first name (the only one who's shown me kindness, or that I exsist, I heard him stick up for me when she was putting me down loudly in there, too), i know her favorite daughter's first name, granddaughters first name, too. She makes life hell on a daily basis. Again thanks for all this info. LM processed my order, I've been waiting over a week for it.. something might have not been in stock. I hope their stock doesn't take that long to come in. I really want this woman to be quiet and leave me alone...or better.. move far far far away. She's made my little home.. a place that used to be peaceful.. loud.. obnoxious, and annoying..where I need earplugs most of the day just so I don't explode. and so uncomfortable for me. Anyway hope to hear back about petition?? Do the family names help, and if so what should I do with them??? Also when waiting for LM stock, if that's my case.. will I have to wait months more before I can try to get ahold of this horrid situation??... Again, blessings, and than you so much for your time for all my questions on the candles. Just keep it simple. Get a small square of paper with four torn edges, and on one side write all the names of the people who you want to expel from that apartment. And over and over on the names, write "LEAVE!" "GO!" "GET OUT OF HERE!" till you can't see the names anymore. Put it facedown under the candle then burn the candle. As for your order, I'm afraid I can't look that up for you, but if you call the shop, they can tell you where your order is at in the process of being put together and shipped. Hi Sister Jean! BLESS YOU!! My parcel arrived. It took about 3 weeks, but that's ok, and the work has begun. I wrote one petition for all 3, and it was big enough to fit under all 3 (they are kind of small). I started a Tuesday night when the moon was waning. I thought that was a good choice. I did what you said for all three, writing the names and blotting them out w GO, LEAVE, ECT., and WOW was God was on my side..these people are so sneaky. I HAD TO WRITE YOU. The "boyfriend" of the woman, told my friend who lives upstairs, who also has a problem with them,cause she thinks she saw one of them going in her car, (she leaves it unlocked because it used to be a somewhat trusting community before they came).Also, even though shes upstairs, they are annoying her with their noisy outrageously unpeaceful, no regards type lifestyle. Singing songs to a baby loudly, who can't even walk yet, and screaming PEEK A BOO, past midnight.. regardless, this "boyfriend" I thought his name was Victor... is her "brother" to my friend! named, what she thinks she remembered he said was something like Alejandro! LIARS!! HOWEVER, I do know for a fact the woman's real name. It's on her mailbox and I've seen mail parcels with the name on it outside her door. So on the 3 pieces on paper you told me to write the names, at least I know this one is correct. The other guy, I just put "---'s brother?-a man with many names (skinny man w tattoos)." Then I know her daughter's name, as they scream it all the time, so I wrote that one. I know the baby's name, but I didn't put it on the paper. Just those three. If the mother and grandmother goes, the baby goes. Plus, I don't wish harm on a baby. In the petition I mentioned the baby, I mentioned that the woman hates therapy, she bashes it, and avoids it. On a personal note I am in therapy for PTSD, and I hated a lot of it in the beginning, but now after much trial and error of looking around, I love my therapist.THIS WOMAN..She does not try. In my eyes she doesn't want help to be a better person. Her only joy AS WELL, seems to be this baby. She doesn't smile. My petition was that she be taken far away to a place of long term, inpatient therapy, that she very much disliked, where she had no full access to her family. She's a terrible person. The crossing candle perhaps is to hate it so much, she has no choice BUT to improve, and she will see where actions like hers take her. Now, on to my question. So I did what you told me LEAVE, GO AWAY, ECT. till you couldn't see then placed downward, ect. I lit my altar candle, then the 3 LM, and began praying. BUT THE CROSSING CANDLE LOOKED LIKE IT WAS ABOUT TO GO OUT. flame looked like it was straight about to die. So I prayed and said God please give me some fast luck and don't let it die, and right there was fast luck oil.. and I put a drop of it. Almost immediately, it rose bright and started burning. But now.. it seems to be burning faster than the others. Did I screw up? Should I drop it in the other 2? Also, today the flames began dancing.. and when I lit my altar candle, before I began praying, my LM confusion candle cackled and let off a BIG puff of COMPLETELY WHITE smoke. I've never seen that. Can you tell me any info? Sorry for all the questions and bless you for all your guidance through my process with the LM CANDLES. You have the patience and kindness of a saint. Apologies if this is the wrong place to write this but I don’t see a section labeled “Black witch candle”. I noticed on the lucky mojo website there is one for sale, what is the purpose of this specific candle? I'd imagine that this candle would be used to tap into dark, witchy forces for a spell, or used in ancestor work, especially if that ancestor was a healer, or a rootworker, or even a witch! Hope that helps! Hello all! Hello Sister Jean! A few quick deployment questions! Does the ocean count as running water or does it need to be a river/lake? Does salt water ruin anything? (People have told me the ovean ‘doesnt count’) ?? I have seen people say they bury their jar at a cross roads and others say they open the jar and pour out the remnants in the middke of the crossroads? Is their one specific practice? Can this be for both positive and negative works? Running water is a river or a creek. The ocean is also running water, when the tide runs. There are numerous references in Harry Hyatt's interviews with black root doctors of the 1930s to the use of the tide waters (in Maryland and in Louisiana) as running water. A lake doesn't count as running water. I want to work with candles and set a petition for my job and another candle concerning success on something else. Question is, can I use the one candle with two different petitions that concern success in two different matters or do I have to use two candles, one for each petition? If the topics are very different -- say, marriage and moving the bad neighbors away -- you would use one candle for each petition because one is to attract and one is to repel. If, on the other hand, you had several job prospects, you could place the logo for each company under one candle. If at all possible, I’d like to get advice as to a shifting wick. I’ve burned several candles on my alter, and at least 4 of them recently (wicks) has shift completely to the right, burning the glass heavily. Cleansing for myself. I will say that there’s a statue of the (Lady of Mount Carmel - Brown Scapular, holding the baby) never known to fail on my alter. The wick shifts toward her scapular as they both are carrying one. This has never happened before getting the statue. Informed that something was set to follow me causing incomplete love/relationships, which bring about nightmares, obstacles and rapid heart rate. assistance is welcome. Thank you. Welcome to the Lucky Mojo forum! Are all the candles related to cleansing? There may be some sort of blockage that needs to be cleared first. I'd suggest burning the Road Opener candle next, and then see how the next cleansing candle burns. I'd recommend doing some divination on the topic too, to see what's going on. 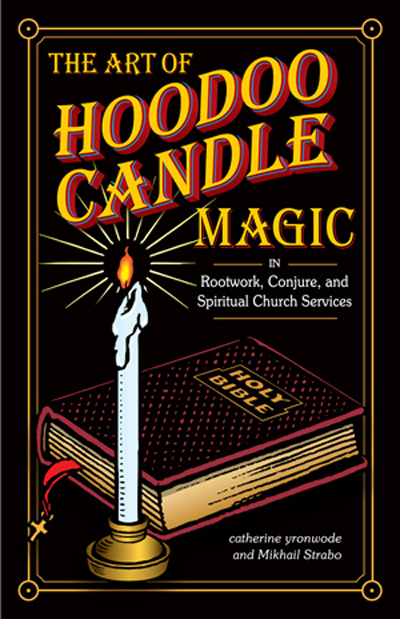 I read in The Art of Hoodoo Candle Magic to use wooden matches. Is that the only type of fire that should be used? I’m asking because me and striking matches don’t get along at all. I think you misread my book. I prefer wooden matches, but in no way, shape, or form is there anything in that book or in conjure as a social and cultural phenomenon that arbitrates how you acquire a flame! Thank you Catherine! Great book by the way, I’ve learned a lot from it. I’ll definitely be purchasing more books! I have started some candle work, but something doesn’t sit right with me. So I was wondering can I just snuff out the candle and start over my work fresh when it feels right? Or should I leave the candle to burn out? Of course you may put out the candles. Performing magic is an act of will. Your own will directs your activities. Welcome back! I'm so sorry to hear about your dog, and your health issues, but we're glad to have you with us again! I think being your looking to draw some new and unknown love, Come To Me sounds like the candle for you. When in doubt, get a reading! Many qualified workers over at AIRR - http://readersandrootworkers.org and HP - http://hoodoopsychics.com/ are waiting to steer you in the right direction. Best of luck, and I hope your year improves before its over! I'm doing a spell to return a lover. I burned a red skull candle, and was told to bury it in my front yard. I live in an apartment in the city. Should I leave the wax at a crossroad, bury it in a potted plant near my door? Any suggestions? This page i wrote as part of my free online book "Hoodoo in Theory and Practice" gives the basis of disposals, so that you can make your own choices rather than follow someone's "rules." If you still have questions after reading that page, just ask again. I read the link, and it was very informative. Thank you. I'm still confused as to what to do with the remaining wax. I can't bury it in my yard,cause I live in an apartment in the city. There are trees out front, that have sidewalk grates around them. I could slip it down into one. The other methods didn't seem right for the work I did. This was Conjure Man Ali's suggestion BTW.I was on your radio show on SEpt 2nd. Cat gave you the post to a link she wrote as a means to empower you to learn about the tradition and how deployment methods are used. Normally a front yard is to draw a backyard is to keep, crossroad is to disperse, running water to send away, under a porch in some spells to curse, cemetery to curse or put to death, burn to destroy. Some spells hidden in trees or holes in trees. You live in an apartment, the easiest suggestion is the front yard of the apartment, or buy a plant and bury it in the house plant at your front door. I have questions regarding Vigil candles. 1. Are those glitters supposed to eventually burned away with the wax? 2. Is there certain appropriate number of inches or hours (time) that a vigil candle can be lit? I understand that Vigil candles are meant to be lit until it burned completely on it's own. I also heard that it can also be lit in sections supposedly one is leery about lighting candle unattended. Here is a link to burning candles in sections. You can mark the candle glass with a marker to determine how long to let it burn. One issue I think you may face is that it takes a while to burn a layer of the wax. Its meant to burn for several days straight. I would light it and let it burn evenly meaning all the wax on top melts then put it out. Otherwise it can make a messy burn with built up wax on one side not melted etc. Some of the flitter will melt, others will stick to the glass, some to the wax some to herbs, those are read as symbols in the candle glass. And although it’s very interesting and maybe someone in the future can relate to what I have experienced. I cannot figure out what my candle spell is doing (as it looks like a big mess - which another site suggested it can happen - but doesn’t explain the candles possible reactions in detail like Lucky Mojo). I am using a black female figure candle with hot foot oil and a green female figure candle with Mercury oil (an oil for business). This is to remove a new employee (see my other posts for the story - her husband earns 100k a year in London - heh! ...clearly doesn’t really need this job then and leaves the business it in a right mess, but doesn’t get a telling off from the owner! I’ve been singled out for her mistakes and although I have looked elsewhere for jobs have not yet been successful which has of course hurt my self esteem and confidence, I am trying to focus on myself rather than the new employee being the problem). On the 2nd night, moved them about 1cm away from another, the green candle decided to burn a little quicker than the black, again the black candle caught up and left a trail of black wax behind the candle, again I guess there is a tight bond between the two? I’m on the third night now and decided to Google search if the candle burns a certain way does it have meaning to it, and how the wax reacts - which way it drips, etc - very interesting and as I said, I think there is a strong bond between the candles as they are fused together every time I’m having to move them in opposite direction away from each other. Tonight there is more green than black on the tray I am using, the black figurine is just dripping down the sides and occasionally makes a noise where the flame is hitting the melted wax on top. Is the fuse normal for candles that are facing away from each other? Or have I let them burn too closely to one another? They are 3” apart from each other now. Candle flames that burn faster are more effected by the work. The wax running to the other candle is them holding on to that person. Since both are running to one another they are both holding on to one another in this work. Hissing can be a spirit trying to communicate with you, could be the individual spirit fighting the work. I would suggest a break up candle (7 day) and a break up sour jar ( discussed on the forum) to cause their relationship to break up as friends/coworkers. if i want use a come to me candle on the altar service, should i write just my desire in the place for the petition paper? Or should i write same style, that i would put under the candle? 9 Times her name and my name? If you're ordering a candle for the altar service, I'd just write your petition in clear, concise wording. "So and So come to me," for example. I'm new to this work and I want to do a bit of candle work for me and my girlfriend( I want to use an uncrossing candle and road opening candle). I saw a worker tell someone on her instagram that one candle can be petitioned for two people, I wanted to know if that is correct or should I have two separate candles for each person for the same type of work? Thanks for your help! I have a quick question: What do you do with the seven day candles as they are called after you are done burning them, and you have gotten your use from them? How do you properly and respectfully dispose of them? You recycle the glass to keep the earth clean. Are there practitioners that do not use candles? I ask because I hate the smell of all candles. It doesn't matter the fragrance or if they have no fragrance. The wax still smells terrible. Hello, SingsAndSeeksHarmony, and welcome to our forum. 1) Yes, many practitioners never use candles. They may not have privacy, they may not have a fire-safe place to burn them, they may have breathing issues such as asthma that preclude any form of burning (Incense as well as candles). Once you know what you like or don't like, you can work accordingly, by needs and concerns and by personal aesthetic preference. How do you all go about storing your candles in extreme weather? We are heading in to a heatwave and I've already had my chime candles warping. I know it's supposed to be a cool dark and dry place, however, we aren't going to have anything like that for the next week. They are all wrapped in plastic, would the fridge be ok for the week? An air conditioned room, if that is not available a cool location like a basement, if that is not available then yes a fridge.